Dry January is officially over, and to celebrate the occasion we’re sharing a delicious cocktail for you to try at home. 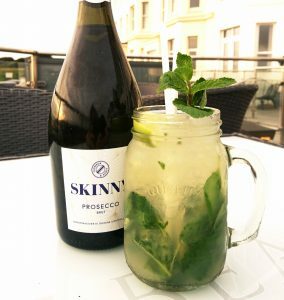 Combining zesty lime, fresh mint, and prosecco, this cocktail is a brilliant twist on a classic mojito, with a refreshingly exotic flavour that we can’t get enough of. Skinny Prosecco is also lower in sugar than your average bottle of bubbly, so it’s a healthier option if you’re sticking to the clean eating plan. Have a go at making the cocktail yourself at home, or head to our bar and request one. – Fill to the top with Skinny Prosecco.